My coworkers and I had Burmese for lunch! It was a first for many of us; a few of us had Burmese at Burma Superstar, which is more of a fusion style. Kyusu has more traditional dishes. To start off our lunch, we had the tea leaf salad. Kyusu serves it in two ways, original or salad style. We opted for the original. Tea Leaf Salad (Original) – A mix of pickled Burmese tea leaves, fried beans, fried garlic, peanuts, premium sesame seeds and premium sesame oil, dried shrimp, tomatoes and fresh cabbage. Hot red chili was served in a small dish along with this dish. What’s interesting is that tea leaf salad is traditionally served at the end of the meal. However, here in the United States, salad is usually eaten at the beginning of the meal or along with appetizers. Lahpet, also spelled laphet (Burmese: လက်ဖက်သုပ်; MLCTS: lak hpak, pronounced: [ləpʰɛʔ]), is Burmese for fermented or pickled tea. Burma is one of very few countries where tea is eaten as well as drunk. Its pickled tea is unique in the region, and is not only regarded as the national delicacy but plays a significant role in Burmese society. Its place in the cuisine of Myanmar is reflected by the following popular expression: “Of all the fruit, the mango’s the best; of all the meat, the pork’s the best; and of all the leaves, lahpet’s the best”. 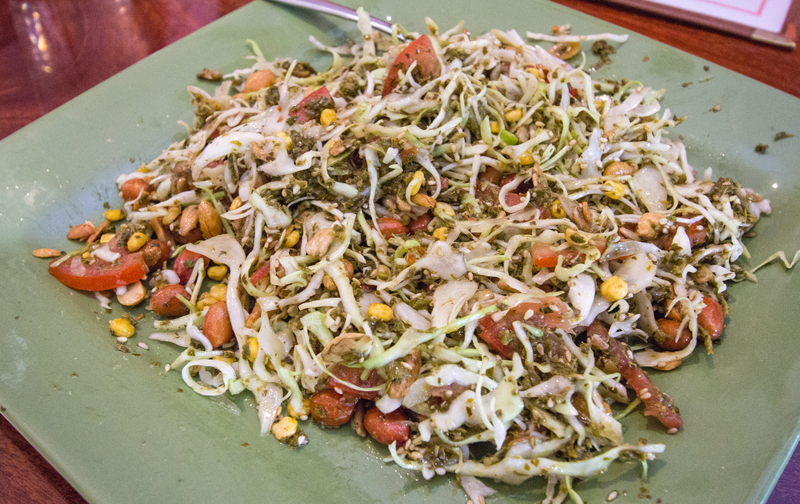 Burmese tea leaf salad (လက်ဖက်သုတ်) is served as two main forms. First is mainly used to serve in ceremonies and is called A-hlu lahpet (အလှူလက်ဖက်, လက်ဖက်သုတ်လူကြီးသုတ် or အဖွားကြီးအိုသုတ်) or Mandalay lahpet. The second one is mostly served with meals and is more popular. The best tea leaves are selected for fermenting and the rest for drying. They are steamed for about five minutes before either drying or fermenting. Young leaves are packed into bamboo vats set in pits and pressed by heavy weights; the fermentation process is checked at intervals and the pulp may occasionally require re-steaming. Lahpet thohk or lahpet thoke (လက်ဖက်သုတ်) is pickled tea salad which is very popular all over Myanmar. Some teashops would have it on their menu as well as Burmese restaurants. It is prepared by mixing all the above ingredients without the coconut but in addition includes fresh tomatoes, garlic and green chilli, sometimes shredded cabbage, and is dressed with fish sauce, sesame or peanut oil, and a squeeze of lime. Many would have lahpet together with plain white rice. This form is traditionally served at the end of every meal. If you lived in Myanmar and a friend popped in to visit, this is the snack you’d serve. Lahpet, which means “green tea”, and thoke, which means “salad”, is an eclectic mix of flavors and textures that includes soft, pickled tea leaves, crisp, roasted peanuts and other crunchy beans, toasted sesame seeds, fried garlic and, if you like, dried shrimp and chopped tomato. It’s meant to be served with all the ingredients in separate piles so that guests can pick out a combination to their own preference each time they grab a handful. While nowadays the salad is typically served as a final course at the end of a meal, historically lahpet was an ancient symbolic peace offering that was exchanged and consumed after settling a dispute between warring kingdoms. Letting each person customize his or her salad toppings, sounds like a perfectly democratic way to stop an argument! That way everyone is at least somewhat satisfied in the end. Lahpet is so important to the culture that when tea leaves are harvested, the best of the crop is set aside for fermenting, while the rest is dried and processed for drinking tea. The freshly harvested tea leaves are briefly steamed, then packed into bamboo vats and set in pits, pressed by heavy weights to encourage fermentation. Packages of prepared laphet thoke ingredients—the tea leaves and all the other mix ins—are readily sold in Burma. Finding fermented tea leaves outside Burma and northern Thailand, however, isn’t very easy. The other option is to try fermenting the leaves yourself. Since most likely you won’t have access to fresh tea leaves, dried green tea leaves make a perfectly acceptable substitute.